Fans of rock and roll music love a good argument. Who was the first, who was the best, who was the loudest. One of the great unanswered questions is this: when did the first all-girl rock and roll band take the stage? Minnesota has a candidate for that honor - a band called the Continental Co-ets. They started during the garage band craze of the 1960s, played a few years, then broke up. But time does funny things, and this is one band rock fans have not forgotten. The Continental Co-ets, in a publicity photo from the 1960s. See a larger image. Listen to their song, I Don't Love You No More. ENTER THE BAND'S NAME IN AN INTERNET SEARCH ENGINE AND THERE IT IS. The Continental Co-ets and their song, "Let's Live for the Present," on the Get Hip Archive Series. Get Hip calls it a "crude garage number with surf overtones and a kick drum that doesn't quit." Judge the record company's words for yourself, but one thing's certain - like the boy bands of the time, the Co-ets could cause a commotion. The band toured extensively, and even had a record which made a few hit song lists in a few Canadian cities. Carolyn Behr, the Continental Co-ets' rhythm guitar player, says initially they didn't pay any attention to their all-girl status. But that changed. "There were a lot of girl bands around at the time - a lot of excellent girl groups. But they didn't play their own instruments. So in that way I suppose we were kind of special," Behr says. The band started in 1963, in the town of Fulda in southwest Minnesota. The high school's music teacher, Dave Edwards, tutored the young musicians and played on stage with the group in its first few appearances. "Those kids practiced until their fingers were just raw. The pain of playing with raw fingers is really something that's memorable, but they did it. That was the kind of drive and passion they had for playing," Edwards says. Guitarist Carolyn Behr says "raw fingers" is a generous description. She says "bloody" is more accurate. Drummer Vicki Ommen says the hard work paid off. "We were pretty good. We did a good job of combining all of our talents, and the sound that we put out was good. We were just kind of thrilled by it all," says Ommen. While the band improved, rock and roll was about to explode. A few weeks after the Continental Co-ets won a case of Orange Crush pop at a talent show, the Beatles landed in New York. The interest in the Beatles was so great it spread to every corner of the country, and helped build an audience for other rock and roll bands like the Continental Co-ets. The Co-ets' big break came in August of 1964, when they played at the Lyon County Fair in Marshall. They didn't know it at the time, but the Vultures were watching.
" We never drank, we never explored drugs, any of that. We were just very good girls. " The Vultures were an area band that might follow Chuck Berry's "Johnny B. Goode" with one of their own songs. Vultures bass player Wally Bloch says the band was looking for ways to boost its visibility, and the all-girl band sparked an idea. "We heard about them through the grapevine. They were still in high school. We met up with them and decided it would be a good idea to join together and have what they call 'the battle of the sexes' - an all-male band against an all-female band," says Bloch. There actually wasn't much of a battle. Mostly, the bands alternated sets before uniting for a final song. The Continental Co-oets played mainly instrumental songs. The "battle of the sexes" played to packed houses. There was a huge audience to draw from because the baby boomers had reached their teenage years. In the 1960s, the average age in the Co-ets' home, Murray County, was a little over 25. Now it's 42 years old. John Senn of Spirit Lake, Iowa scored a national hit in the mid-60s with the band Dee Jay and the Runaways. Later he produced a recording session for the Continental Co-ets. He says not only was there a huge audience, but Midwest rock and roll bands also had hundreds of first-class performance halls to use. "The big bands probably created most of that, because some of these ballrooms were built in the '20s, '30s and '40s. We had something provided by the big bands that allowed rock and roll to really spawn a life right here in the Midwest," Senn says. The Continental Co-ets went far beyond the Midwest ballrooms that gave them a start. They built an audience in Canada during three tours of the western provinces. Co-ets drummer Vicki Ommen says they often traveled all night on the Canadian plains. She says they played for everyone from Eskimos to loggers to miners. "I remember one place that had a pot bellied stove, and we had just a board that we changed our clothes - behind the board. And I think it had rained that night. It was really muddy, and we were ankle-deep in the mud. But the northern lights were just beautiful," Ommen recalls. Vicki Steinman Ommen was the drummer for the Continental Co-ets for the three years the band was together. Ommen is a teacher in Windom, Minn. The band always had at least one parent traveling as a chaperone. Vicki's dad Duane Steinman remembers the Canadian tour as a special time. He was recovering from cancer then, and the girls' music was powerful medicine. "I still wasn't so sure I was even going to live, so it was fun for me. It took my mind off of my problems. You were proud of what the kids were doing," says Steinman. During its Canadian tours, the band stopped at radio stations along the way to drop off a copy of the song, "I Don't Love You No More," its only commercial release. It got air play and helped boost the band's following. Looking back, drummer Vicki Ommen says the touring helped her grow up. She met people who grew up in far different circumstances than those in small-town Minnesota. She says it made her appreciate her life a little more. Plus she learned something about money. She saved hers and it helped pay the bills later. "We minded our p's and q's. We were very good. We never drank, we never explored drugs, any of that. We were just very good girls," says Ommen. The band lasted about three years before breaking up in 1967. But even though it had a short run, the legacy of the Continental Co-ets keeps coming back to its members in unexpected ways. Rhythm guitarist Carolyn Behr met her husband decades later because of the band. He was a rock and roll history buff from New York researching 1960s garage bands. He traveled to Fulda to track down information on the Co-ets and met Carolyn there. Collectors have discovered the group. Drummer Vicki Ommen says she gets requests for copies of the band's only commercial release. Still unanswered though, is just how unique this group was. 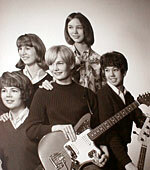 Research indicates it was likely the first all-girl rock and roll band in at least a five or six-state area of the upper Midwest. An Internet search turned up only one girl band which predates the Continental Co-ets, a group from England. For the band members, whether they were first is not a matter of great concern. What is important is the discovery and pride of being in a band.